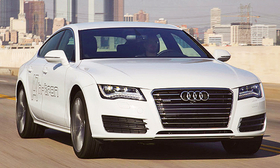 Audi calls the A7 h-tron plug-in hybrid concept the first hydrogen-fueled performance car. LOS ANGELES -- Automakers are beginning to nudge the hydrogen fuel cell vehicle out of the illusion factory that is Southern California and into the broader conversation about the future of clean transportation. At last week's Los Angeles auto show, battery electric vehicles and hybrids, which once dominated California clean-energy car talk, were far overshadowed by announcements of new fuel cell concepts and investments in hydrogen fueling infrastructure. The developments indicate that automakers see enough promise in fuel cell vehicles to take concrete steps toward creating a viable market for them. Honda, a longtime leader in fuel cell vehicle development, agreed to chip in $13.8 million to help build fueling stations in California. Toyota, which already is aiding that effort, will collaborate on a fueling network in the Northeast. Volkswagen indicated that once the infrastructure develops sufficiently, it's prepared to bring a range of hydrogen-powered vehicles to the market. And leading into the show, Toyota unveiled its first production fuel cell car, the Mirai, which will appear in showrooms next year. Toyota won't be the first to put a fuel cell vehicle on the streets -- Honda, Hyundai and Mercedes-Benz have had tests or small-scale leasing programs under way -- but it's the first to put a retail sticker price on one: $57,500. The price, which doesn't include federal and California incentives of about $13,000, hardly accounts for the millions of dollars of r&d and component costs that have gone into fuel cell vehicles. Rather, at a level somewhere between a Prius and a Tesla Model S, it reflects Toyota's best guess of what a consumer might be willing to pay for the latest in powertrain innovation. "We thought we could sell at this price level," Yoshikazu Tanaka, chief engineer of the Mirai and former chief engineer for the Prius plug-in hybrid, said during a Mirai launch event in Japan. "And we had a gut feeling it is economically feasible, and that's why we chose it." The momentum behind fuel cells suggests that automakers see their principal challenges -- sparse fueling infrastructure and high cost -- as potentially more surmountable over the long term than the ones facing battery EVs, including limited range and long charging times. Both the Mirai and Honda's next-generation fuel cell vehicle can travel 300 miles on a tank of hydrogen fuel and require three to five minutes to refuel at the pump, an experience similar to gasoline. They emit only water vapor from the tailpipe. "Considering environmental issues, we automakers have a strong determination to switch to this clean energy as early as possible," said Honda President Takanobu Ito. "Therefore, perhaps it's too optimistic to say in 20 years' time, but I dream of seeing a considerable number of fuel cell vehicles running on the roads 30 years from now." Toyota plans to deliver 700 Mirai units worldwide next year and projects cumulative sales of 3,000 by the end of 2017 and "tens of thousands" by 2020, said Chairman Takeshi Uchiyamada, calling the Mirai a "social and economic game changer." Those numbers depend on major improvements to the hydrogen fuel filling infrastructure, where auto industry and public investments are beginning to spur progress, primarily in California. Toyota already had lent more than $7 million to Southern California startup FirstElement Fuel to begin construction of 19 stations across the state, in conjunction with a large state grant. Last week, Honda agreed to a $13.8 million loan that would help FirstElement propose construction of a dozen more stations in California. But with its announcement last week of a deal with France's Air Liquide, Toyota became the first automaker to signal interest in expanding the U.S. hydrogen footprint beyond California. The deal calls for developing and building a dozen stations around Greater New York and Boston. Such efforts, if successful, could help unleash more of the costly fuel cell work that automakers have kept tethered to the laboratory bench for more than a decade. Toyota, for its part, has been working on fuel cell cars for more than 20 years. One reason it has taken so long to get to this point is that the technology involves a chemical, not mechanical, process. "As an automaker, we had little experience in that field," Tanaka said. Honda, which introduced its first fuel cell vehicle in 2002, is now working on its third-generation vehicle, which it previewed here last week, though the U.S. launch has been delayed to 2016 amid a worldwide quality review. General Motors, which launched a test fleet of 119 hydrogen-powered Chevrolet Equinox crossovers in 2007, partnered with Honda last year to develop fuel cell systems and hydrogen storage technologies for 2020. At last week's auto show, the VW brand showed a hydrogen-fueled version of its Golf SportWagen capable of traveling 310 miles between fill-ups, and Audi showed what it called the first hydrogen-fueled performance car, the A7 h-tron plug-in hybrid concept. Meanwhile, VW is testing a fleet of hydrogen cars in California and is preparing a larger test fleet, said Hans-Jakob Neusser, development chief for the brand. VW isn't prepared to offer one to customers until it is confident that enough fueling stations will be available. "It really depends on infrastructure," Neusser told reporters. But some of the other pieces are falling into place. Neusser said parent Volkswagen Group designed its new MQB scalable platform to accommodate a modular fuel stack, so a hydrogen car can roll down the assembly line bumper-to-bumper with cars that have a range of other powertrains, from gasoline to diesel to battery EVs. Volkswagen Group also decided to make fuel cells a groupwide r&d project, meaning that its other brands -- such as Bentley, Seat, Skoda and Porsche -- could use the technology if needed. "When the market is there," Volkswagen Group of America CEO Michael Horn told reporters, "we are flexible enough."